Fifty mini-satellites are to be sent into space to celebrate the launch of the first such object, Sputnik 1. The "nanosats", each weighing 1kg, will blast into orbit on board an Ariane rocket in 2007, said Arianespace. Each satellite will represent a nation, and will do small-scale research experiments during two years in orbit. The former Soviet Union's Sputnik 1 was the size of a basketball and became the first artificial satellite of the Earth on 4 October, 1957. "Just like 50 years ago, when the first manmade Earth satellite was launched, these nanosatellites will signal a new era for scientists worldwide," said Jean-Yves Le Gall, chief executive officer for Arianespace. The company markets launch services for the European Space Agency (Esa). "Arianespace is very proud to be participating in this commemoration," he added. "Supporting science and research is an integral part of our assigned mission." Compared with Sputnik which weighed 83kg, nanosatellites weigh under 10kg and can be sent up in clusters in low-Earth orbit, which is less than 2,000km above the planet's surface. Increased miniaturisation of electronic and mechanical components has made it possible to construct much smaller and lighter satellites. These satellites can significantly reduce the cost of access to space for many nations and can be used in groups, or swarms, for Earth observation. UK satellite company Surrey Satellite Technology Limited has developed small satellites, like SNAP-1 which was launched in June 2000. It weighed 6.5kg and carried micro-miniature GPS navigation, camera technology, onboard computing, propulsion and attitude control technologies. 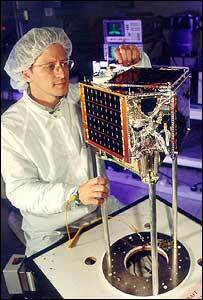 Commercial telecommunications satellites are costly, commonly as big as buses, and can weigh up to eight tonnes. At the time of Sputnik 1's historic launch, which was described as "the simplest kind of baby moon", the US and the Soviet Union were in a race to space. Some voiced concerned about its launch because its orbit would take it over the US seven times. Others speculated that its launcher rocket could be capable of carrying a nuclear weapon thousands of kilometres. Sputnik 1 was followed a month later by Sputnik 2, which carried the first living creature, a dog called Laika, into space. In December 1957, a US rocket carrying a test satellite exploded. 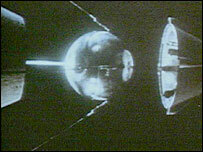 The US successfully launched its first satellite, Explorer, in February 1958. The mission for 2007 was announced at the International Astronautical Federation (IAF) congress in Vancouver, Canada.